Restoration Church is a community devoted to the message, mission, and movement of Jesus Christ in the Chicago suburbs. A simple meal, a small group of uncommon friends, and God. These were the ingredients of a global movement with a mission to restore the world from its broken and chaotic state, one person at a time. The movement wouldn’t come through money, power, force, or intimidation. Instead, it was defined by the very opposite: love, humility, sacrifice, and faith. What began with twelve disciples of Jesus Christ in the heart of ancient Jerusalem continues today in homes and small-group communities across the world. This is the foundation to Restoration Church. We are a church committed to the original message, mission, and movement of Jesus Christ that continues to transform hearts and lives forever. Read more about this story from the Bible, The Last Supper. We’re a church unbound by walls or an address. We are an organic network of small-group communities who meet in homes. We use the resources we have to worship God, grow as followers of Jesus, and serve others. 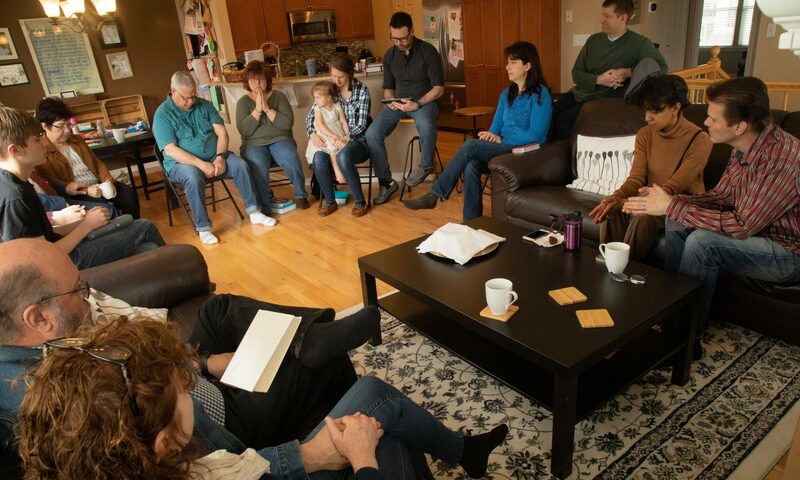 Weekly services are simple, transformational gatherings devoted to the study of scripture, communion, prayer, fostering authentic relationships, and being sent back into the world on mission. Jesus restores sinners by re-creating them as His masterpieces for a new purpose: to do His good works on earth. Reflection: Discover your testimony — your story of God’s radical grace. Write it down using no more than three sentences. Plan to share it with the group this week!